This recipe (adapted from MSD Living Well with Diabetes cookbook) and photo are courtesy of MSD. Heat butter in a saucepan. Add cinnamon, cloves, cardamoms and fennel seeds and sauté until fragrant. Add onions, green chillies, mint leaves, curry leaves and bay leaves. Sauté till the onions turn transparent. Add ginger-garlic paste. Sauté for 2 minutes. Add tomatoes and sauté well. Add meat, stir until meat is almost cooked. Add vegetables, turmeric powder, masala powder and salt. Sauté for 2 to 3 minutes. Add rice. Give a quick stir till the rice is nicely coated. Add 6 cups of water. Stir and add seasoning to taste. 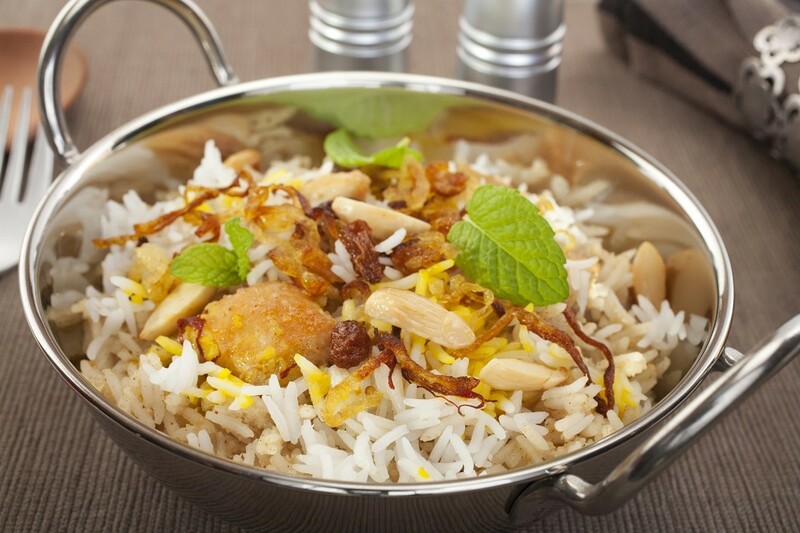 Add 3 tsp of lemon juice to avoid rice strands from sticking together and to enhance the taste. Transfer the mixture to an electric rice cooker. Cook until the rice is done. After the rice is done, add a tsp of butter and mix evenly. Transfer the rice to a bowl. Add cashew nuts then dish out and serve. Using brown rice (or wild rice) varieties offers a low GI* alternative, which improves sugar control and satiety. In order to cut down on saturated fat: use lean cuts of meat such as skinless chicken breast, lean red meat or trim the fat off lamb. Use rapeseed oil/olive oil instead of butter or ghee. Portion control is important in order not to consume a large amount of carbohydrates at one go, so ensure that you consume a small-medium serve, where you can also include a salad on the side. The mix of herbs and spices as well as the addition of lemon juice are a great way to reduce salt use. *The glycemic index (GI) is a measure of how quickly blood sugar levels rise after eating a particular type of food. Thanks, Sally for highlighting this. We have rectified it. We appreciate and value your input and support.